An all-new supercharged 4.2-liter V8, 400 horsepower S-TYPE R and a new five-speed manual transmission for the 3.0-liter V6 model spearhead the launch of an extended and refined S-TYPE range. All models feature a completely redesigned interior with optional touch-screen display and an enhanced occupant safety system. A new six-speed ZF automatic transmission, available across the range complements the refined power delivery of the revised Jaguar 3.0-liter V6 developing 240 bhp and larger capacity 4.2-liter V8 engines in both normally aspirated 300 bhp and supercharged 400 bhp forms. The new front suspension and extensively revised rear suspension deliver outstanding ride comfort with poised, agile handling, in keeping with the Jaguar tradition. 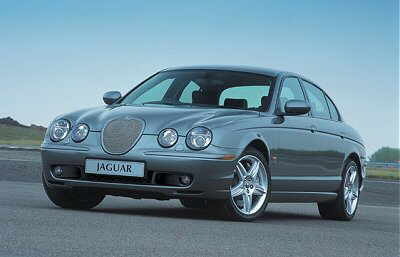 S-TYPE's launch in 1999 marked the beginning of a major product-led transformation for Jaguar. Following the launch, the company's worldwide sales doubled in just over a year and S-TYPE sales to date have exceeded 135,000 cars. "S-TYPE has been Jaguar's fastest selling model in history and we are determined to keep buyers just as enthusiastic in the future. The changes to the latest generation of S-TYPE will continue to provide buyers with the most stylish design but enhance the driving experience through significant changes under the skin. The S-TYPE R firmly demonstrates our passion for fast, dynamic vehicles that give as much pleasure to drive as they do to own," said Mike O'Driscoll, president, Aston Martin Jaguar Land Rover North America. Leading the radically revised S-TYPE line-up is Jaguar's most powerful sedan yet, the formidable S-TYPE R. Its hard-charging abilities are delivered with the full complement of luxury, comfort, and style that Jaguar is known for. With 400 horsepower on tap, Jaguar's new 4.2-liter supercharged V8 engine propels the S-TYPE R from zero to 60 mph in just 5.3 seconds and then on to an electronically limited top speed of 155 mph. What's more, the engine's broad torque band and the new, six-speed automatic ZF transmission ensures equally rewarding response and flexibility in everyday driving conditions. To match the powerful engine and advanced transmission, the S-TYPE R is equipped with sports suspension, race-engineered Brembo brakes and the latest generation of Jaguar's Computer Active Technology Suspension (CATS), to optimize ride and handling. Now enhanced for improved driving ability and comfort, particularly during cornering and braking maneuvers, CATS uses uprated springs for increased roll-stiffness and electronically controlled, two-stage adaptive dampers for ride refinement. CATS now automatically switches the rear dampers slightly ahead of the front pair at low speed to reduce transient understeer for improved agility and turn-in performance. At high speed, the system automatically switches the front dampers ahead of the rears to increase transient understeer for enhanced stability. The car's luxurious, sports-style interior features leather-trimmed R Performance steering wheel and sports seats, which are 16-way adjustable, with memory on the driver's seat. The new-look S-TYPE fascia and door casings are finished in distinctive, grey-stained birds-eye maple trim. Exterior design cues clearly signal the spirited character of the S-TYPE R. They include a rear spoiler for high-speed handling, exclusive (18 x 8 inch) 'Zeus' alloy wheels (18 x 9.5 inch on the rear), xenon headlights and a bright-finish mesh front grille with color keyed surround. Reflecting the ultra-high performance of the S-TYPE R, it carries the same distinctive red R logo that will be featured on the nose cone of the new Jaguar R3 Formula One racing car for the 2002 season. First seen on the R Coupe Concept at the 2001 Frankfurt Motor Show, the R badge will be incorporated onto all future Jaguar R Performance derivatives and options. The S-TYPE R is priced from £47,400. The entry-level, 2.5-litre V6 model costing just £24,950 is fitted with Jaguar's new AJ-V6 engine, which develops 201 bhp, and will have a standard-equipment list that includes side curtain airbags, climate control, wood trim, leather gearknob, electrically-adjustable front seats, 60:40 folding rear seats, electronic parking brake, automatic headlamp activation, dynamic stability control (DSC) with traction control and ABS, 16-inch Helios alloy wheels and a four-speaker sound system. It is also offered in SE specification (from £28,900) which includes the new six-speed ZF automatic transmission, leather seats with electric adjustment, a wood 'n' leather steering wheel with stereo controls, metallic paint, front foglamps, auto-dimming rear view and door mirrors, and Spirit 16-inch alloy wheels. The 3.0-litre V6 (from £31,400 for the SE) and enlarged 4.2-litre V8 engines have not escaped the revisions; both feature improved three-stage variable-geometry induction and continuously variable cam-phasing systems for quicker engine response and enhanced refinement. Although the output of the 3.0-litre V6 remains unchanged at 240 bhp, the 4.2 V8 (from £36,000 for the SE) has been enlarged from 4.0 litres and had its power increased by 19 bhp to a round 300 bhp; torque is up by 8 per cent, yet fuel economy and emissions are improved. The Sport specification will also be continued, but will be available only with the 2.5 V6 and 3.0 V6 engines (£27,450 and £29,950 respectively). These versions have a colour-coded exterior with dechromed detailing plus leather sports seats with electric adjustment, a leather sports steering wheel, maple veneer trim, sports suspension with uprated springs and dampers and 17-inch Herakles alloy wheels. 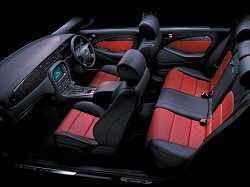 The five-speed Getrag manual gearbox is standard, but the six-speed ZF auto is an option, as are 18-inch alloy wheels. Jaguar has addressed the criticisms that were made of the car's cabin, and its emphasis is on establishing the S-Type as a more traditional alternative to the more youthful, sporty and lower priced X-Type. Sales of the S have faltered since the launch of the X-Type, and Jaguar has recognised the need to differentiate more clearly between the two ranges.